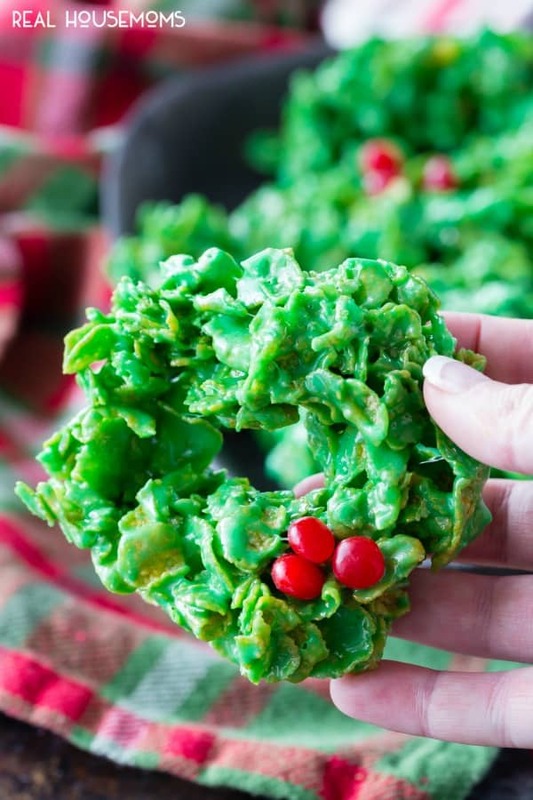 Christmas Wreath Cookies are a festive, fun, and tasty Christmas dessert. These cornflake wreaths are fun to make & easy enough that kids can help too! My favorite Christmas cookie recipes are always the ones that are crazy festive. Give me cookies loaded with red and green or covered in Christmas sprinkles and I’m a happy girl! 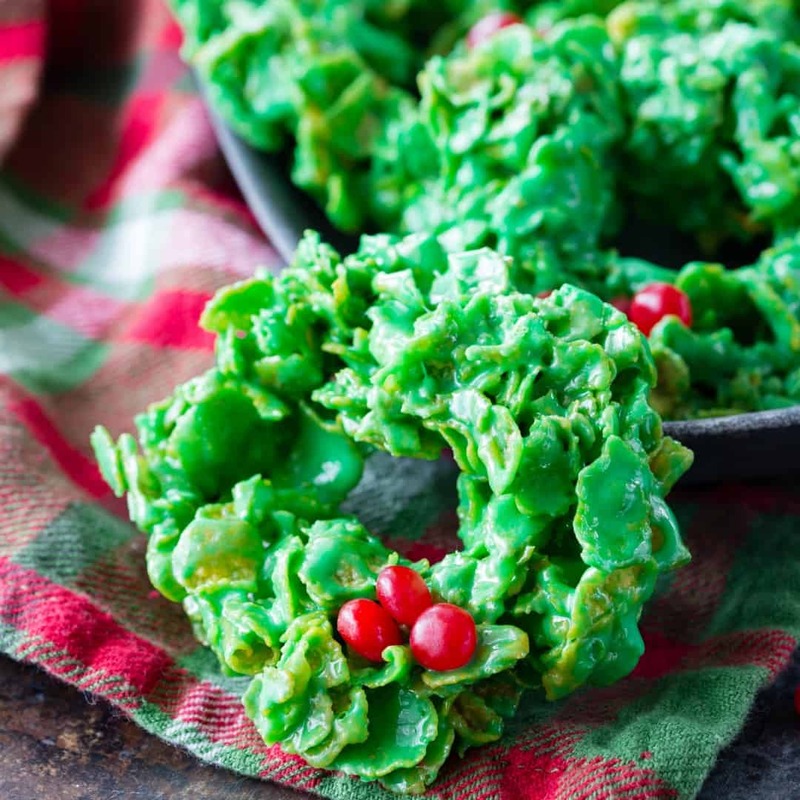 These Christmas Wreath Cookies are always at the top of my holiday baking list. They’re SO easy to make, no baking required! You can decorate them with the cinnamon candies together like I did for a “holly” look or spread them out around the wreath so they can act as ornaments. Either way, they’ll be the first thing to go from your Christmas cookie plates! Like this recipe? Pin it to your CHRISTMAS pinboard! Christmas is full of traditions, spending time with family, and creating beautiful memories! One tradition that I will always cherish is the time I spent making Christmas cookies with my mom. We would make the same delicious cookies each year and occasionally add a new cookie. Wreath Cookies were always one of my favorite treats and until I made them this year, I forgot how yummy they tasted. I love that I can now carry on the wonderful tradition of making Christmas cookies with my own children. They really enjoy helping me in the kitchen and they love baking cookies. 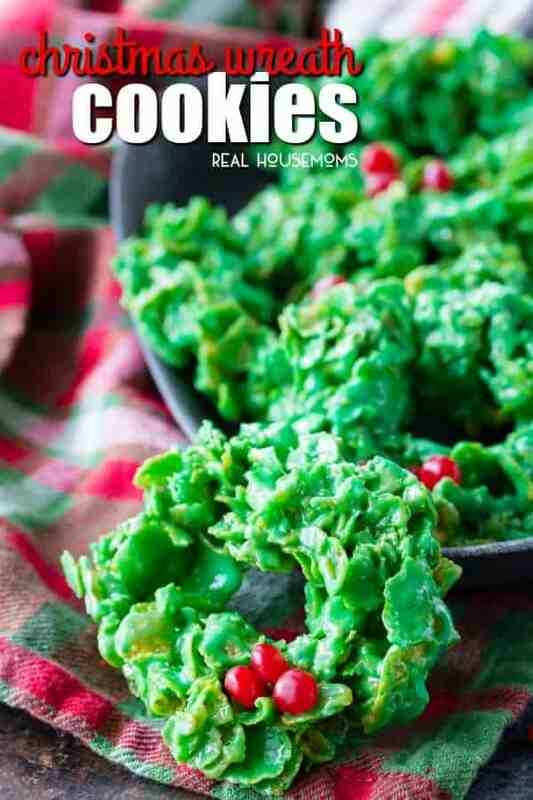 Kids love helping make Cornflake Wreath Cookies, maybe it’s the green color, getting their hands messy, or eating them! Christmas Wreath Cookies are festive, fun, and tasty! My youngest even likes the cinnamon candy. He doesn’t like anything cinnamon. Want more easy Christmas cookie recipes? Pour 6 cups of Cornflakes into a large bowl and set aside. Melt a stick of butter in a saucepan, on low heat. When completely melted, add a bag of mini marshmallows. Stir until the marshmallows are completely melted. Pour the green mixture on the cornflakes. Mix until the cornflakes are completely coated and green. Put Crisco on your fingers. 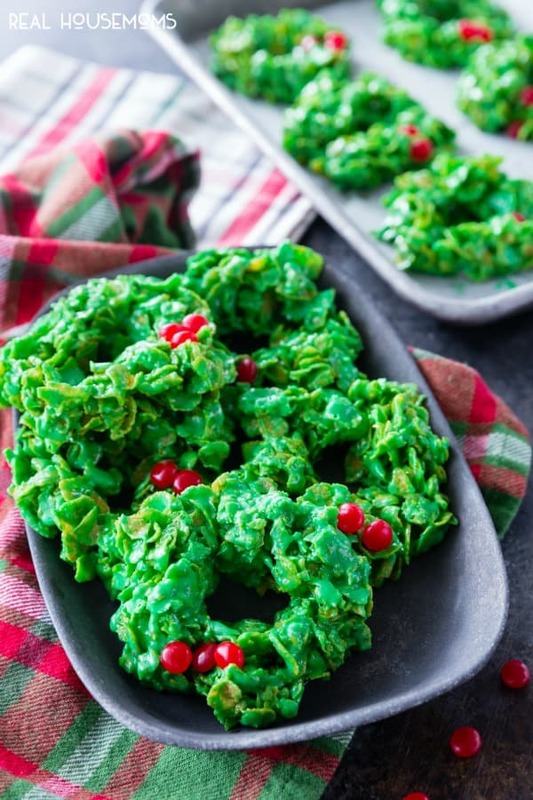 Place a small handful of the cornflake mixture on a parchment paper-lined baking sheet and form a wreath by making a hole in the center. Place three cinnamon drops near each other on the wreath. Let the wreaths rest on the baking sheet until they are set, about 1 hour. You can speed up the rest time by placing these cookies in the fridge until set. You can place 3 cinnamon candies together for a Holly look, or spread them around the wreath. my friend uses Teeberrys And they taste amazing! Had not made these in years, many years. Remembered them today and dug through my recipe box. When it read “24” miniature marshmallows to 4 c. flakes, something didn’t look right. I am glad I clicked on your site right away and didn’t spend hours searching for this recipe. My youngest daughter was our cookie baker at a young age. Notes on the card remind me of the rivalry these sisters once enjoyed. The older sister took credit for typing the recipe card, and I see the younger one has crossed out her sister’s name and put her’s in its place. I’m looking forward to some fun when I post a picture of the cookies on FB. I would not be surprised if the sister out of state doesn’t whip up a plate of these for her grand-daughters. Thanks for the memories your corrected recipe brought to me. Oh, btw, what is a teaberry? I’m confused, where does it mention teaberry? Post a picture of my phone screen right now. I’m all for “entrepreneurship”, but recycling recipes so you can plaster your site with ads is a real turn off. Thank you so much for the feedback as we are always looking to improve.